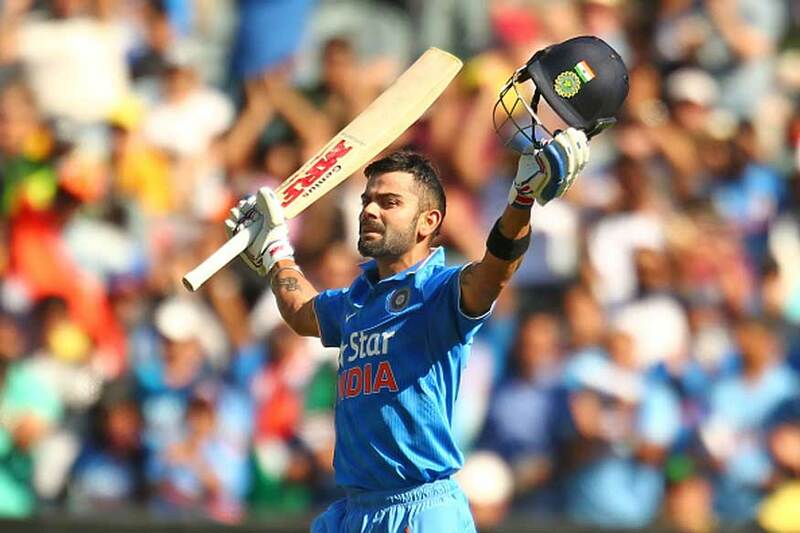 Kohli's unbeaten century helps India beat New Zealand by 7 wickets in 3rd ODI. Virat Kohli and Mahendra Singh Dhoni, players of different styles and temperament, blended seamlessly on Sunday to construct a masterly chase in the third one-day international against New Zealand at the Punjab Cricket Association stadium. With the confidence-boosting seven-wicket victory, India bounced back grabbing a crucial 2-1 lead in the five-match series. Both Dhoni and Kohli shattered records as they shared a 151-run stand for the third wicket. Dhoni (80) crossed 9,000 runs in ODIs. Kohli (154 n.o.) reached the milestone of 3,000 runs at home with another sublime century — his 26th — and underlined his rising stature. Their presence blunted the challenge of New Zealand, who after being put in, raised 285 in 49.4 overs. The Black Caps, after a blazing start, faced a familiar middle-order capitulation highlighted by the loss of six wickets for 46 runs within 57 balls, to slip from 153/3 to 199/8. But a ninth-wicket stand of 84 off 67 balls between James Neesham (57), who scored his maiden ODI half century, and Matt Henry (39) wrested the advantage from India provided by their bowlers, particularly the spinners Kedar Jadhav (3-29) and leggie Amit Mishra (2-46). But that was till Dhoni and Kohli unfolded their magic. The skilful New Zealand seamers, in their initial bursts, had packed off openers Ajinkya Rahane and Rohit Sharma by the ninth over. It enforced an uncomfortable silence in the full house, which was broken only by the sight of Dhoni striding to the crease, ahead of Manish Pandey, at No 4 position. Kohli, let off at six in the slips, didn’t err again. The Indian chases of late had banked heavily on him and the Indian Test captain began to pace out the innings with characteristic clarity and sense of purpose. With dew troubling the bowlers, Kohli’s rock solid presence and a friendly track allowed an under-pressure Dhoni to bat freely and he locked himself in a zone the way champions often do. Three sixes that soared from his bat were directed either straight to the sight screen or long off. Kohli, who was already on 21 by the time Dhoni arrived, reached a sedate half-century with a boundary engineered by his favourite flick. For few moments, Kohli was overshadowed by Dhoni who was magnificent on the front foot and also pulled with power and disdain as New Zealand seamers peppered him with short balls. He brought his first half-century of the year with a single to mid-wicket and quickly caught up with Kohli. The presence of India’s two best batsmen provided an absolute batting treat to the cricket-hungry Sunday crowd and put the hosts in control. However, the free-flowing knock by Dhoni came to an abrupt end when his lofted drive was caught at short cover. But Kohli, batting with monk-like concentration, brought up his century in a similar understated manner with which he reached the 50-run mark. For, there was work to be done and Kohli with a quick 97-run stand off 75 balls with Pandey, ensured it was done with 10 balls to spare. For New Zealand, Martin-Guptill and Tom Latham had provided them an ideal start. But once Umesh Yadav, again impressive with the new ball, removed Guptill, it became easy to tame the visitors.Jadhav continued to be the mystery spinner for New Zealand and cut short Kane Williamson’s stay by trapping him in front. Ross Taylor signalled a return to form with his 57-ball 44, before he was swiftly stumped by Dhoni off Mishra. It immediately initiated the familiar procession, the sturdy presence of Tom Latham, who brought up his second half-century of the series, being an exception. Fall of wickets: 1-46 (Guptill), 2-80 (Williamson), 3-153 (Taylor), 4-160 (Anderson), 5-161 (Ronchi), 6-169 (Latham), 7-180 (Santner), 8-199 (Southee), 9-283 (Neesham), 10-285 (Boult). Bowling: Umesh Yadav 10-0-75-3 (w-3), Hardik Pandya 5-0-34-0 (w-2), Jasprit Bumrah 9.4-0-52-2, Kedar Jadhav 5-0-29-3 (w-2), Axar Patel 10-0-49-0, Amit Mishra 10-0-46-2. Fall of wickets: 1-3 (Rahane), 2-41 (Rohit), 3-192 (Dhoni). Bowling: Matt Henry 9.1-0-56-2 (w-1), Trent Boult 10-0-73-0 (w-2), Tim Southee 10-0-55-1 (w-2), Mitchell Santner 10-0-43-0, James Neesham 9-0-60-0 (w-2).